According to August Mueller, proprietor of Flying Meat and purveyor of VoodooPad Pro, the concept behind VoodooPad Pro is simple. It’s a garden for your thoughts--a place where you plant ideas, cultivate and develop them, link, tie, and combine them, and grow them into something real. After a couple of weeks playing with VoodooPad Pro 4.1.2, I’m pleased to say that’s not just a pile of marketing hooey. In fact, it may even be an understatement. VoodooPad Pro looks like a basic text editor. It bears a striking resemblance to, and shares the same feature set as, Apple's TextEdit, which is enough to make you wonder why you wouldn't just use TextEdit. The answer's simple: VoodooPad Pro is able to link your ideas and other information together. VoodooPad Pro is designed to work like a highly customizable, personalized wiki, a type of Web site that allows you to quickly create, interlink, and cross-reference information. For example, type a name into VoodooPad; if that name appears in your Address Book, you’ll see a hyperlink underneath the name. Click that link and a menu appears, giving you the option to either e-mail the person whose name you’ve just typed or open their card in Address Book. Create a new page within your VoodooPad Pro document and you’re required to give it a name. Type that name anywhere on a different page and VoodooPad automatically creates a hyperlink to that document. Click the link and you jump to the page; click the Back button and you’re back where you started. Also, as is the case in a normal wiki, if you type an intercapped word, like "InterCap," that word will appear to be hyperlinked. Click the link and VoodooPad Pro creates a new page titled InterCap in your document where you can begin adding new information. The first time you open VoodooPad Pro, you see a home page that includes examples of the kinds of information you can add to a document, including images, Web links, and custom text and paragraph formatting. Any document you create in VoodooPad Pro can be encrypted and secured with a password. As a word processor, VoodooPad Pro is not as powerful as programs like Apple’s Pages ( ), but I found it more than sufficient for what I typically do with a word processor and perfect for typing basic notes. The main document editing window looks exactly like TextEdit, right down to the location of the buttons, but VoodooPad Pro gives you better access to other text formatting options, such as font type, style, size, color, and spacing, using a floating palette. My only complaint about this palette is that the extra formatting options are buried at the bottom of 12 other document-related items, so it was sometimes a hassle to get to the tools. It would have been much easier if these formatting tools were grouped with the other tools on the program's toolbar. 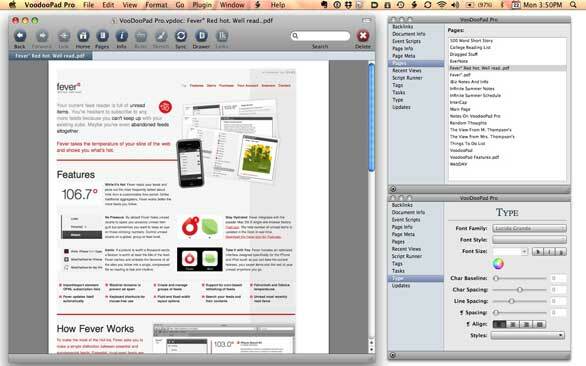 VoodooPad Pro gives you several ways to create new pages in your document. You can type information, you can use the PDF button in the print dialog window of any application to send a PDF directly to VoodooPad Pro; you can drag text or images from a document or the Finder to a page; or you can use the Services menu to send selected text directly to the program. Voodoo works its hoodoo magic: Combining the power of a wiki with the simplicity of a text editor, VoodooPad Pro helps you create intricate cross-referenced documents with relative ease. I did find that PDF support was a little dodgy in VoodooPad Pro. PDFs sent via the print to PDF option could not have the viewing percentage changed via the program’s View menu item. The viewing percentages were inactive, so I didn't discover that it was possible to change them until I right-clicked the PDF document. PDFs dragged to VoodooPad Pro had these options enabled, but the percentage by which the size of the document changed never corresponded to the percentage I selected. In fact, in some cases, selecting a larger percentage made the PDF document smaller. Also, PDFs dragged to VoodooPad Pro could be double-clicked and opened in Preview, but those printed to VoodooPad Pro could not. The vendor is aware of this, and plans a fix in a future version. What I was really pleased to learn was that, because VoodooPad Pro really works like a Web browser, the program retains all the links within a Web page when you paste linked text copied from a Web page or use the Services menu to push selected text into a page. For portability, there is a free VP Reader at the App Store that, as the name implies, lets you read VoodooPad docs you've synced to your iPhone ( ) or iPod Touch ( ). While you can't edit anything using VP Reader, all the reading features work just like they do in the desktop application. Internal and external page links are all accessible; embedded PDF documents are subject to some of the same limitations, but otherwise it's a useful way to carry your VoodooPad Pro documents in your pocket. Also, any VoodooPad document can be exported into several formats, including a Web export that creates a complete Web site based on your VoodooPad document. And VoodooPad documents can be shared and updated by multiple users on any WebDAV server, such as MobileMe. VoodooPad Pro 4.1.2 is an excellent tool for collecting, storing, and linking information. The program's ability to intelligently create links to other pages in your document makes it easy to cross-reference information that you've already collected. While the program has some limitations when it comes to embedded PDF documents and access to some text formatting features, these are small complaints about what is otherwise an excellent program. The standard version, which is $20 less than the Pro version, contains most of its general features, but lacks event triggers, the built-in server, and whole document encryption. The Lite version, though free, is extremely limited and has relatively few features.